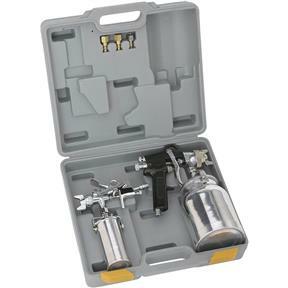 Be prepared for almost any finishing job with this set. This high pressure spray gun features fully adjustable pattern control, dripless canister vent, siphon feed, external mix for fine atomization, spun aluminum canister and paint nozzle. 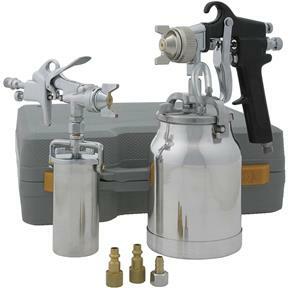 The touch up spray gun with siphon feed features fully adjustable pattern control, spun aluminum canister and paint nozzle. Includes two female and one bayonet hose connectors and plastic carrying case. Material: Medium solids (enamels and lacquers). Not compatible with water-based materials.